Overview : Capture is a compact metal clip that lets you carry your camera on any backpack strap, belt or bag. 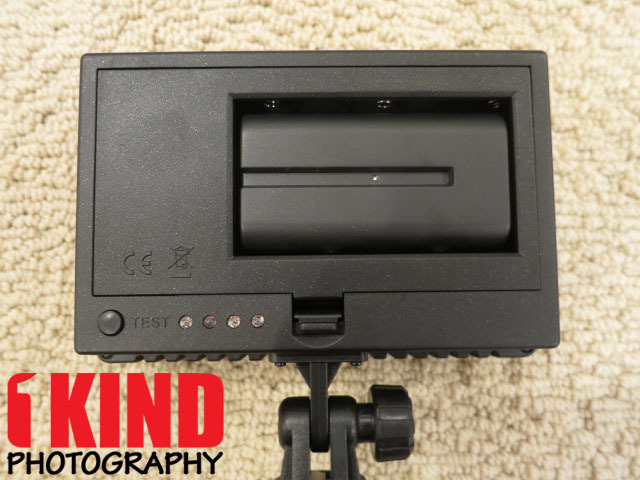 Its unique quick-release system keeps your camera rigidly secure, yet instantly accessible with the click of a button. Capture frees you from cumbersome camera straps and holsters and lets you go anywhere and do anything with your camera safe and in reach, making sure you never miss another shot. There's a Standard and Pro version now: Hobbyists and beginners have different needs than serious pros and adventurers, hence 2 versions of the clip (more info below). Beautiful new ergonomic shape: The new Capture looks sleek and stunning - but the new shape is more than just eye-candy. It was redesigned to give you total comfort no matter where on your body you wear it. Peak Design also redesigned the clamping bolts to make them easier to screw down, even if you’re wearing gloves. Lighter and slimmer: They trimmed the fat, making an already compact product lighter, slimmer and more unobtrusive. Better security features: There are now 2 new secondary locking systems to give you more security options. 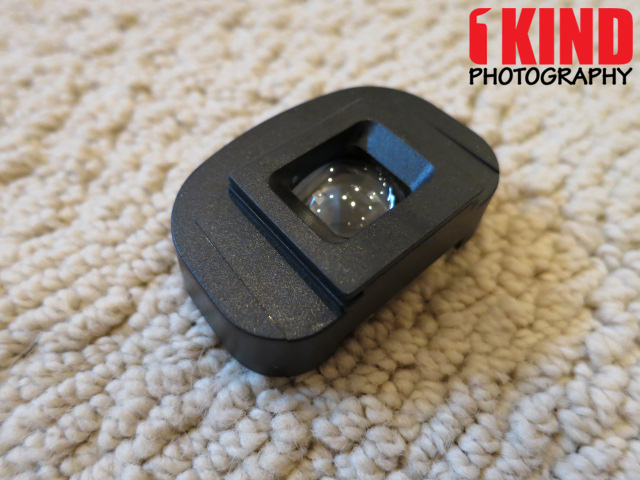 A safety lock has been added to the quick-release button, giving you a quick and easy way to prevent accidental release. 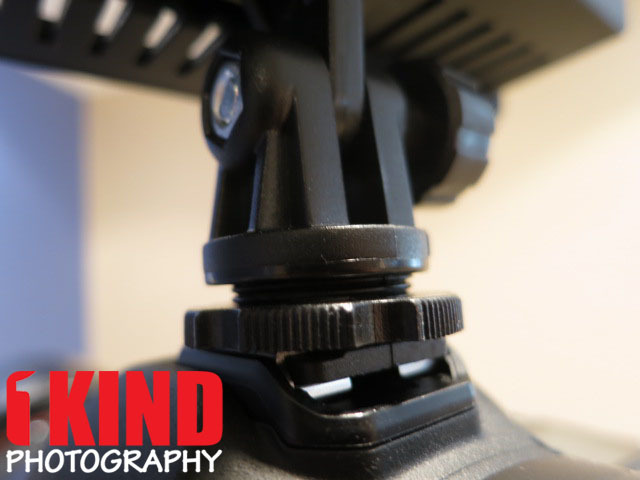 For maximum security, the all-new twist lock tightly clamps your camera in. 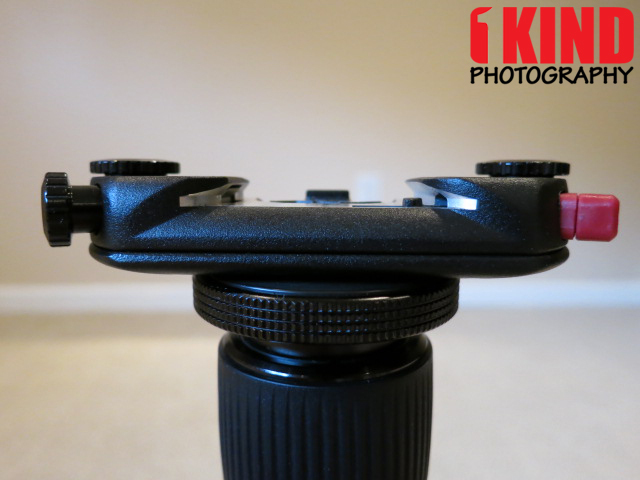 The new twist lock also stabilizes your camera if you’re using Capture as a tripod clamp. 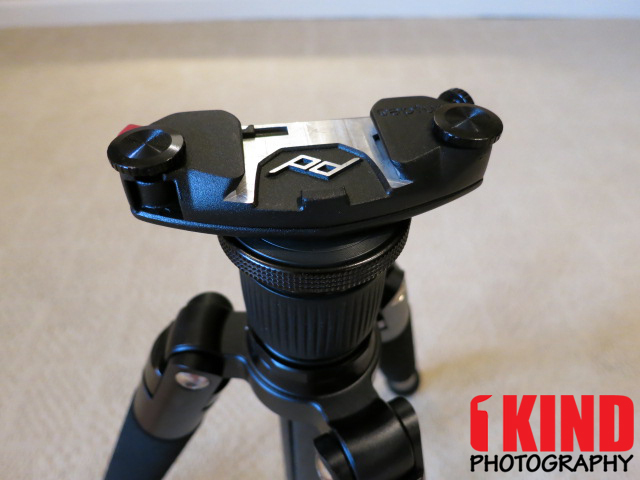 Works with more tripod heads (PRO): CapturePRO comes with one of our three PROplates. 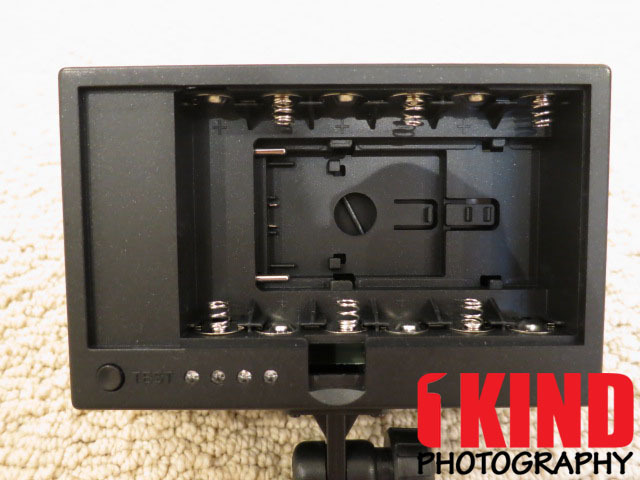 These plates offer compatibility with more tripod heads (ARCA and Manfrotto RC2) and camera types (SLR and Compact Mirrorless). Works with sling straps (PRO): Capture, equipped with the standard plate, is designed to work with Leash and Cuff using our micro-anchor attachment system. CapturePRO, equipped with one of the PROplates, works with Peak Design straps as well as classic sling-style straps made by companies like BlackRapid®. PROplates feature a special load-bearing D-ring that lets you attach your sling strap directly to your camera when you’re not using Capture. 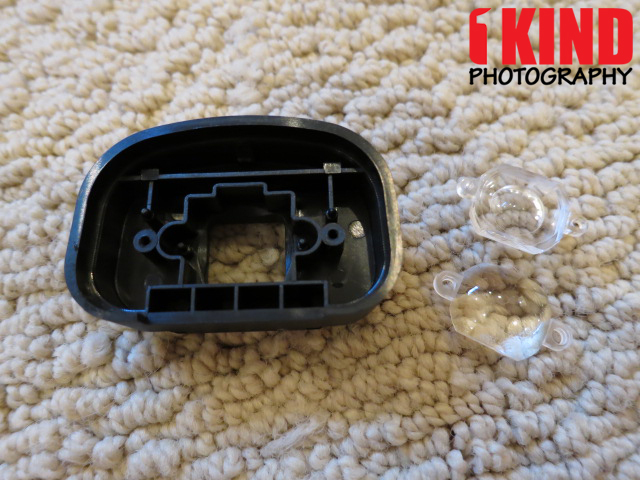 THIS REVIEW WAS POSTED BEFORE THE PRODUCTION MODELS WERE AVAILABLE TO CUSTOMERS AND RETAILERS. 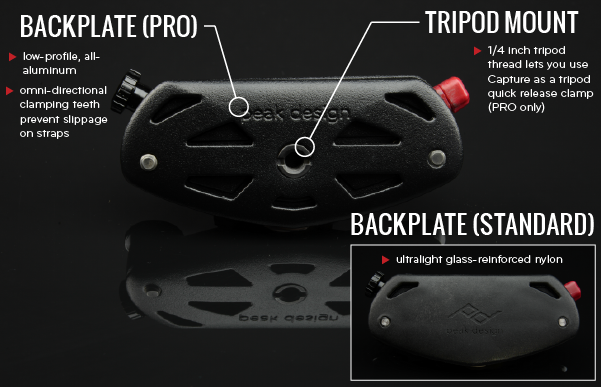 Quality/Usability : Back in 2011, Peak Design launched the original Capture Camera Clip on Kickstarter. They spent the past 2 years reinventing a solution from the ground up, incorporating feedback from thousands of backers and customers. 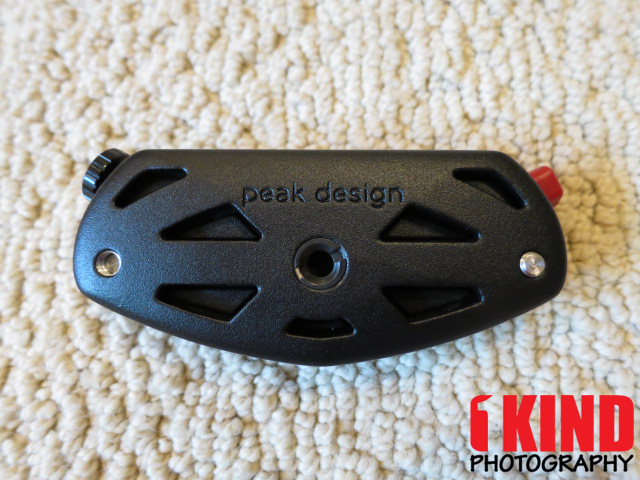 With all that implemented, Peak Design has come up with the Capture Clip v2. 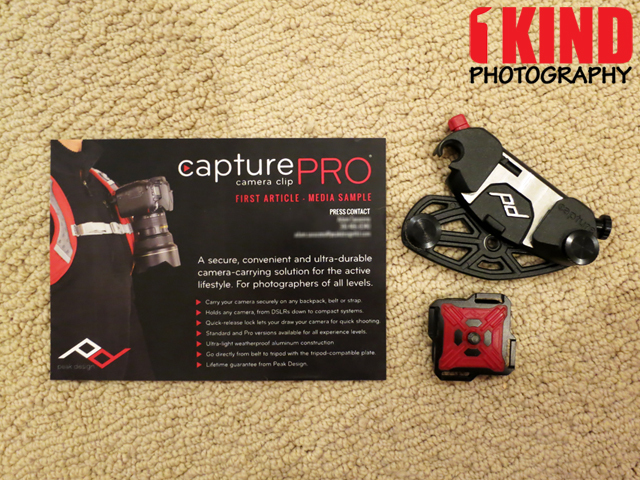 We were one of the first ones to receive the CapturePRO before anyone else. So what is the difference between Capture v2 and CapturePRO v2? Capture is the standard entry-level version of Capture which has a glass-reinforced nylon backplate and comes with their standard quick release plate. 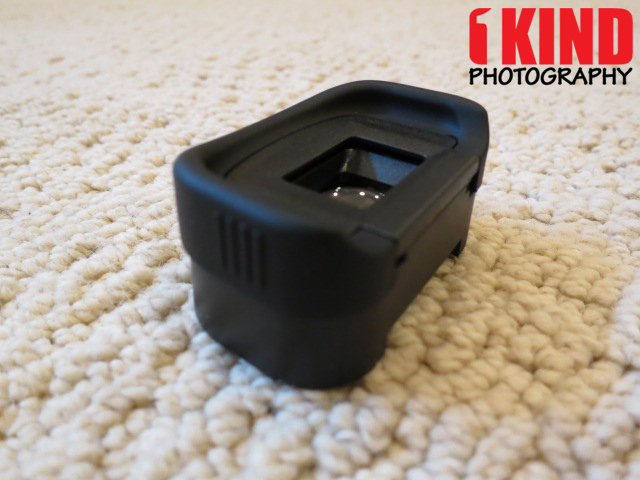 It's also a simpler, less expensive camera clip for folks who just need a better way to carry their camera. 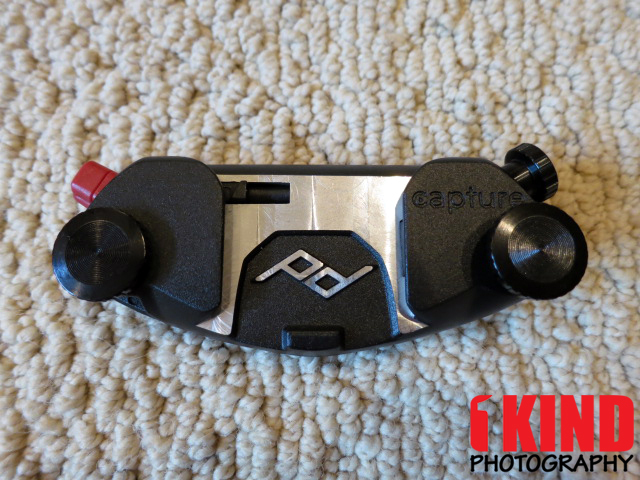 CapturePRO is their flagship professional version of Capture which features an all-aluminum body. 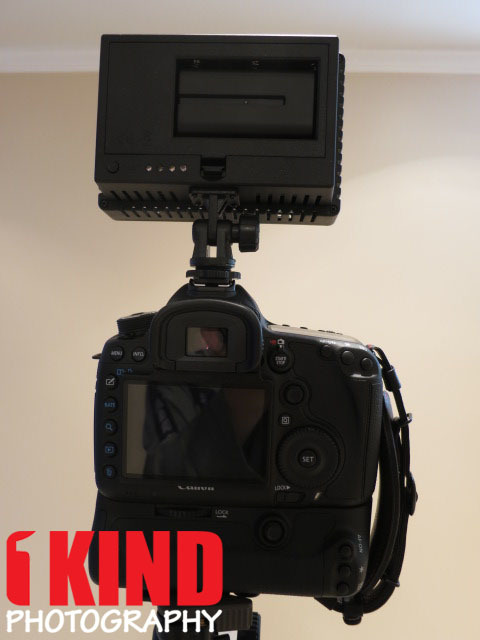 It can be used as a tripod head and is compatible with multiple tripod systems, as well as sling straps and hand straps. The CapturePRO is designed to meet the strength and compatibility needs of serious photographers and is better suited for extreme activities. 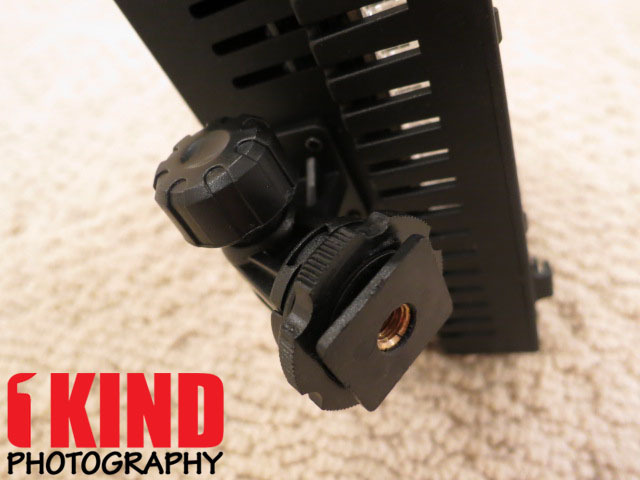 Both clips are designed to carry cameras of any size. The Capture v2 looks like the Capture v1 but with v2, its more curvier and rounder in all the right places. 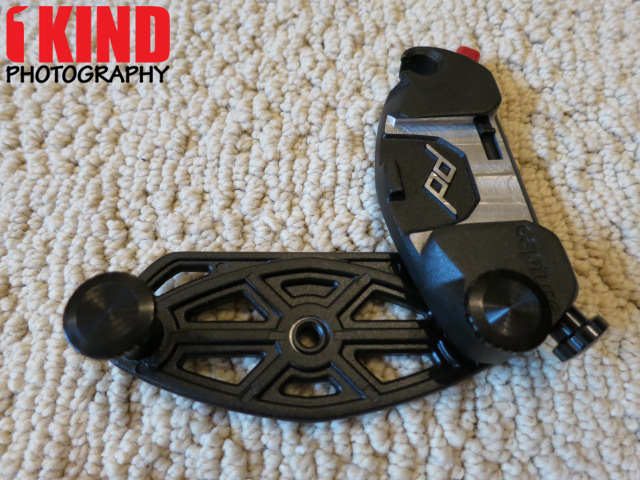 The CapturePRO's backplate will offer a 1/4-inch tripod thread that lets you use your Capture as a quick release clamp for your tripod (more info below). You can even attach a sling strap such as BlackRapid to it. 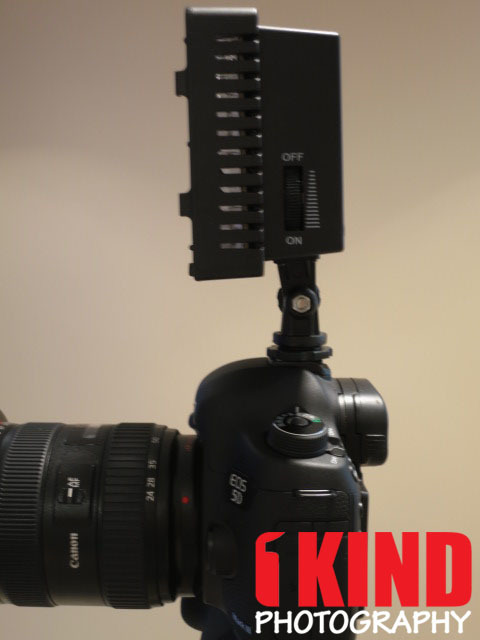 If mounting this directly onto a tripod, just note that you won't have the ability to angle your camera like a ballhead would do. Normal Capture v2's will have a smooth backplate. Peak Design will be including serial numbers to production Capture's that will be laser engraved on the backside of the Capture's main plate (where it says PATENT PENDING). As you can see, the twist lock is back but has been revamped. 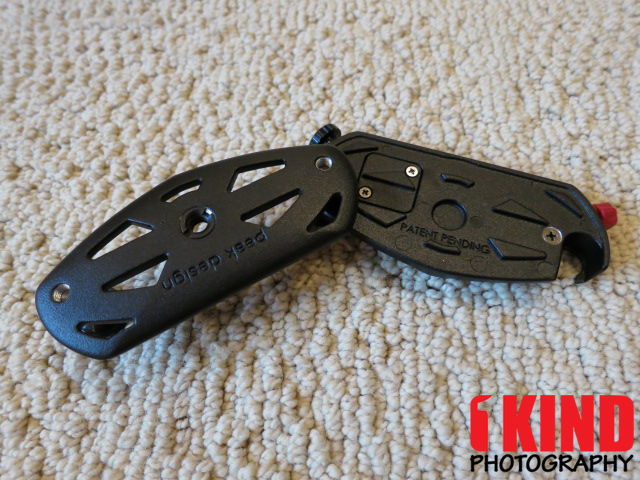 In the original Capture Clip, when you twisted the twist lock, it was a small screw that would keep it in place. Now, when you twist the twist lock, a bracket pushes out and locks the Peak Design plates in place. The clamping bolts has been revamped with a new look to it. No more protruding, plus shape (+) design. It's much sleeker with a lower profile. You'll still be able to loosen the bolts with ease but at least it won't be getting caught on straps or clothing. 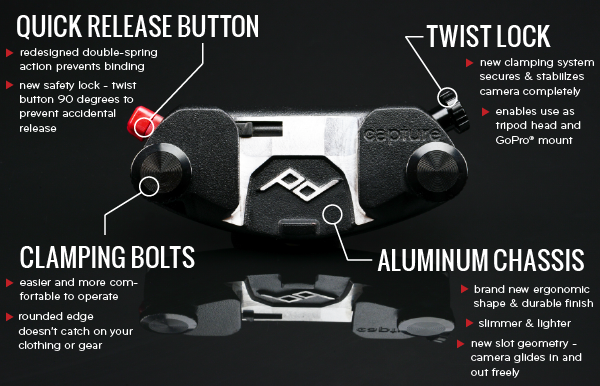 Also revamped is the quick release button. Now you're able to lock the release button from accidental pressing. To lock the quick release button, all you have to do is twist the red quick release button. This will prevent the button from being pressed in. 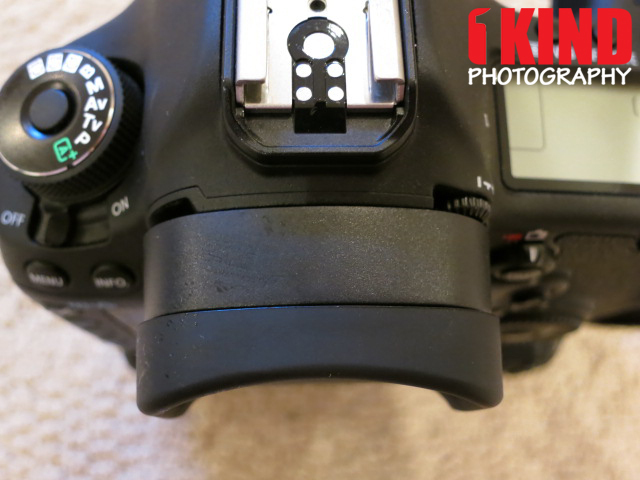 If you need to release your camera, twist back to button and press the button in. 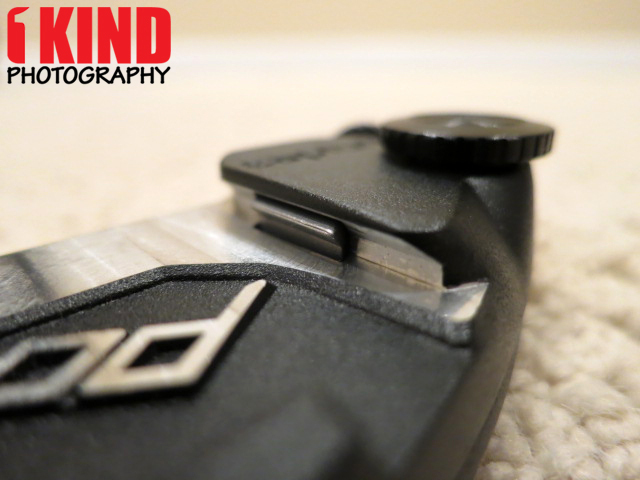 As mentioned above about the CapturePRO backplate has a 1/4-inch thread, that turns your CapturePRO into a quick release clamp. All versions of the Capture Clip (even the original) works with the ARCAplate, DUALplate (Arca-Swiss and Manfrotto RC2) and MICROplate (Arca-Swiss - suitable for smaller cameras). Read our full review on the PROplates. Those with heavy gear especially with a gripped camera, the Capture still sags if clipped to a pants belt. It works well for those who are not gripped. 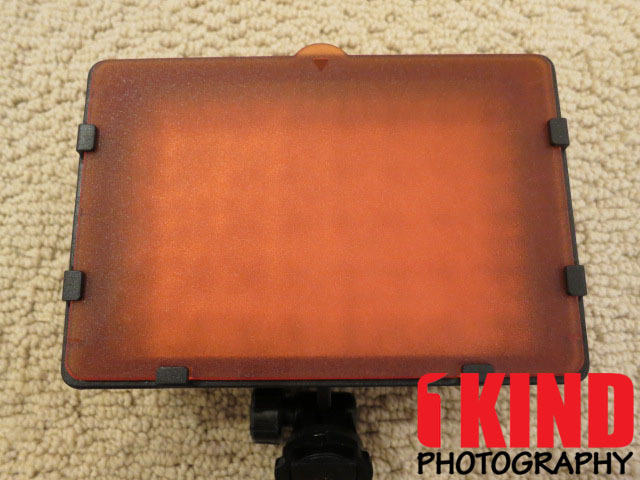 To solve this issue, Peak Design has released the PROpad that will help solve this issue for photographers with heavier gear. You can see the video of the PROpad below. It will also work with the original Capture Clip. 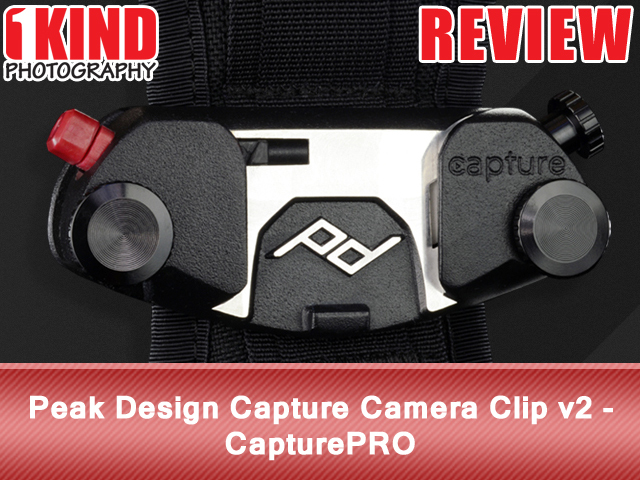 Conclusion : Overall, the Peak Design Capture Camera Clip v2 - CapturePRO has kept the integrity of the original Capture Camera Clip but refined it with a much sleeker design. 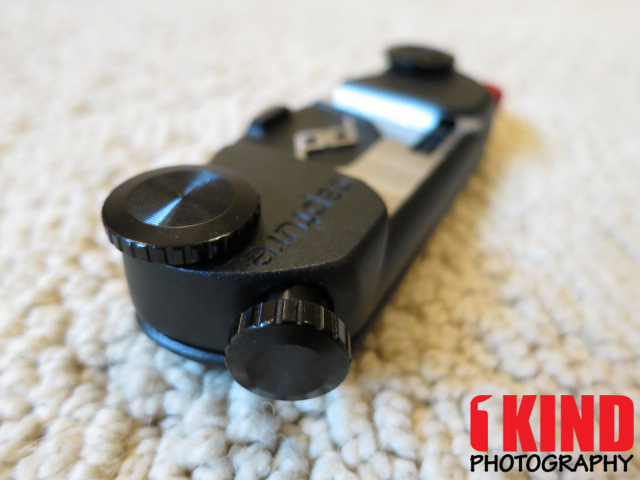 We love the fact that the CapturePRO can turn into a quick release clamp. No more accidental pushing of the quick release button by locking it in place. The twist lock offers a much sense of security rather than relying on the tip of a screw and the clamping bolts won't get you tangled up or caught on something. The Weye Feye is an innovative external device that enables a remote and wireless control of a DSLR camera via a smartphone application. The Weye-Feye generates its own Wi-Fi network and connects via a USB port. 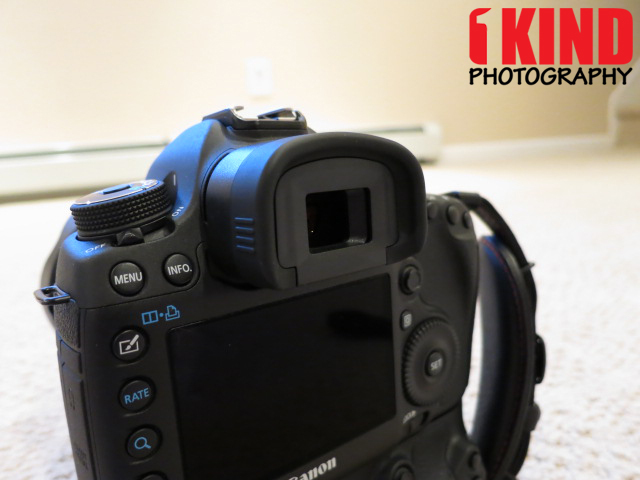 It is compatible with most of the Nikon and Canon cameras. The Weye Feye App is available as a free download for Android and soon for iOS. The high-performance central processing unit and long-life battery ensure its self-sufficient operation. 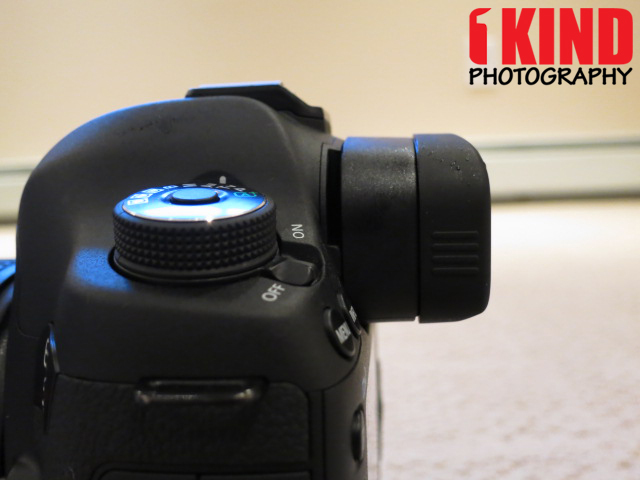 The LiveView function allows you to change your camera settings (ISO, Shutter, WB, etc.) and the built-in web server allow you to edit the images, transfer them to your mobile device and share them instantly on social networks. The Weye-Feye gives you greater freedom of movement. It is said to have an 8 hour battery life in it. This should last long enough for most shoots. 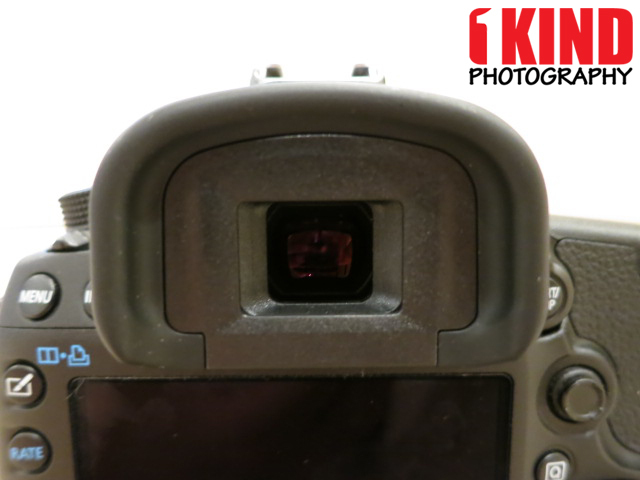 It even boasts an impressive .2 second latency, which means your changes to the camera’s settings are super fast. 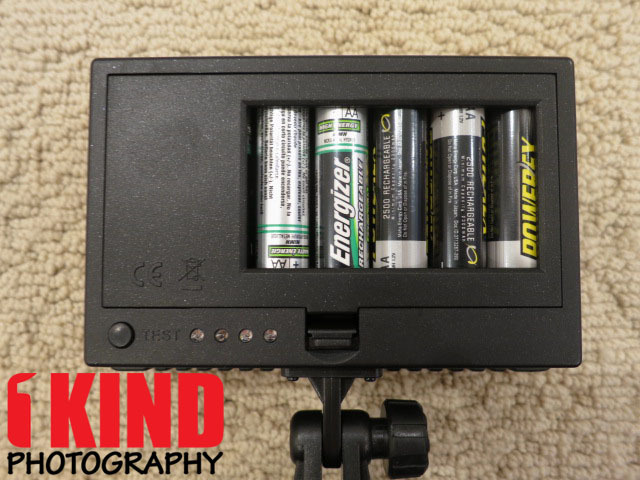 Yes, there are similar products similar to this that is already available such as the Camranger but even the Camranger doesn't offer 8 hours of battery life. 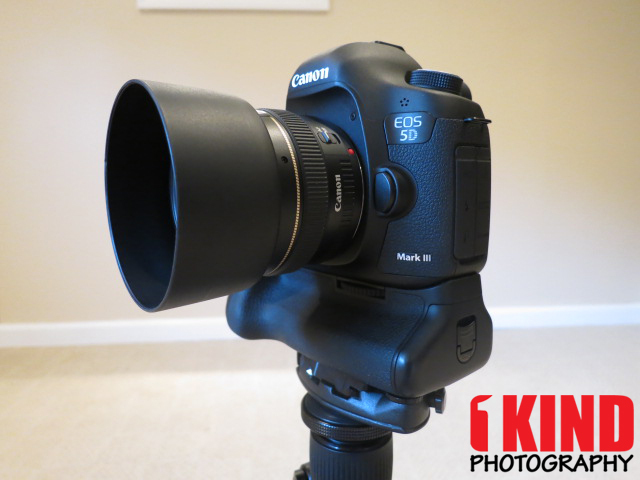 Also, the more products, the better for us photographers both in options and competitive pricing. According to the press release the Weye Feye will be released in the UK in September 2013 for around €249, no word yet though on a US release. 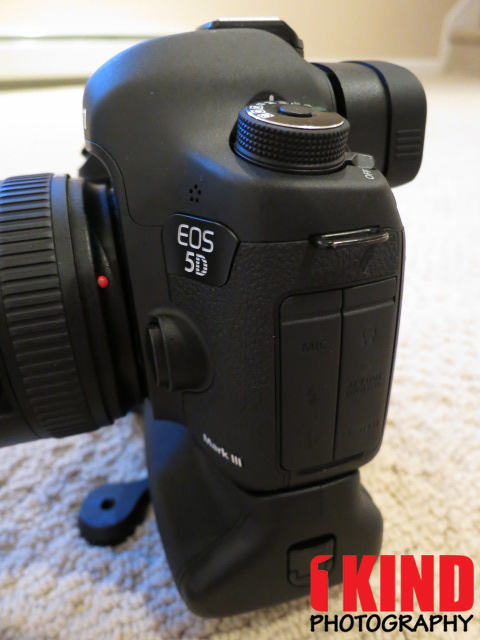 The Weye Feye will smartify your DSLR! Don’t miss a bit of the action without having to take the plunge! 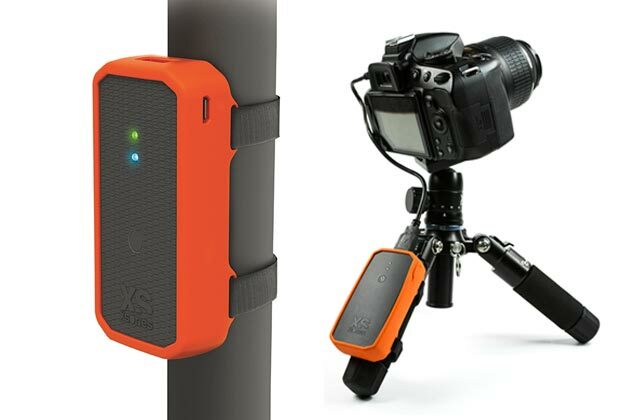 The high tech accessory brand XSories is proud to introduce a new technological innovation, the Weye Feye, an external device connecting to a DSLR. It generates its own Wi-fi network, enabling a wireless and remote control of a camera via an App on smartphones and tablets (available on Android and iOS). 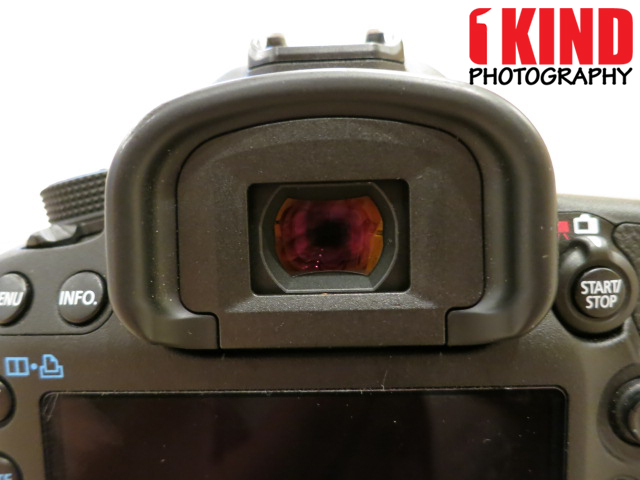 The Weye Feye adapts to most of the Canon and Nikon cameras. With its built-in battery and server, the Weye Feye is completely autonomous from the camera. It operates with 802.11n Wi-fi technology, which ensures a powerful signal with higher speed and larger range. The range of the signal (up to 80 meters) coupled with a record 0,2 sec latency makes it the highest-performing product on the market. With the Live View function available via the App, you will be able to take over the control of the camera without touching it. 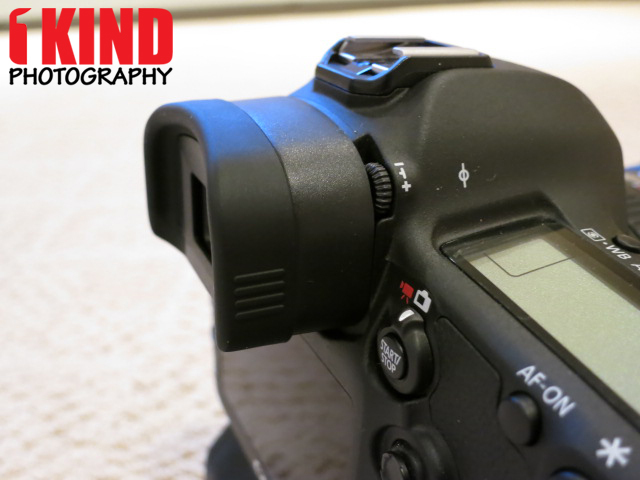 Change the set-up (ISO, white balance, aperture, etc), switch in between modes (photo or video, time lapse), control the focus (manual or automatic) and wirelessly set off the capture of images. The Gallery will allow you to view, select and share the images from the smartphone or tablet directly to a computer or via social networks and sharing platforms (YouTube, Facebook, Instagram, Twitter, Dropbox, etc). 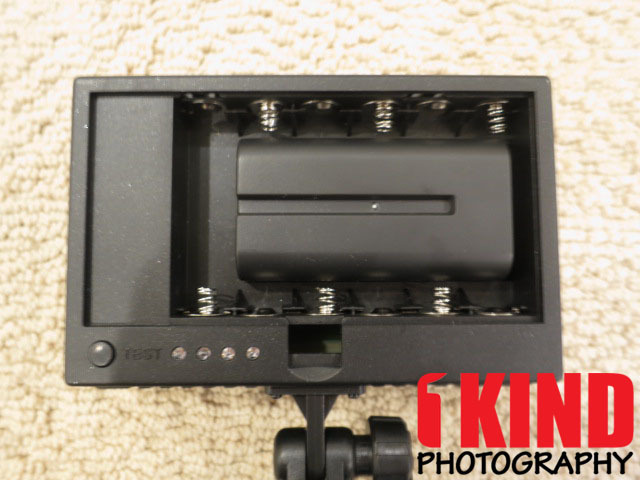 The integrated server allows several users to access the Gallery without installing the App.You can now get away from the LCD screen of your camera thanks to the live view function during both still capture and recording. The Weye Feye allows users to engage in new approaches of photography helping them to achieve elaborate composition on their own without having to direct an assistant. Operating your camera(s) remotely gives you more freedom of movement and enables you to capture moments your presence would otherwise disturb. The Weye Feye will be available in September, at a recommended retail price of 249€. Enjoy the LiveView on your smartphone / tablet (Android) and iPhone/iPod touch/iPad with a latency of only 200ms depending on network interference and operating distance. Choose the zone of interest on your LiveView and zoom in with just a single touch. 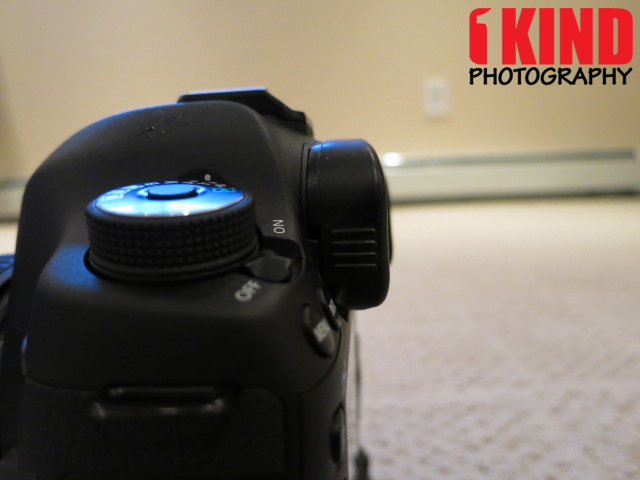 Settings, such as ISO/Aperture/Shutter Speed/White Balance can be changed remotely without reaching the camera. 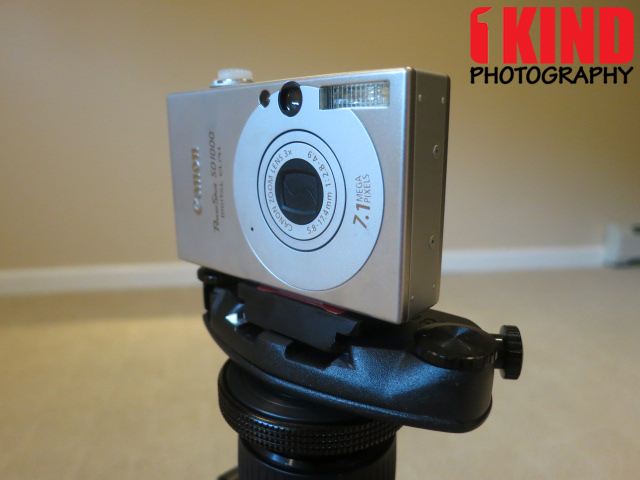 Shoot photos in single shot or continuous mode, depending on your needs. 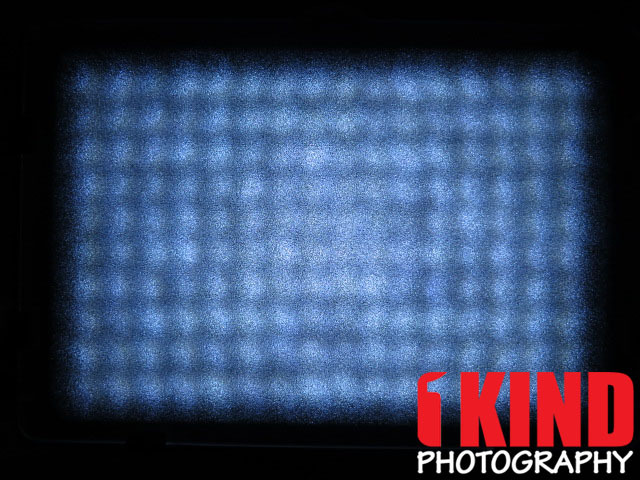 Depending on your DSLR, you can also change the metering mode through the App. 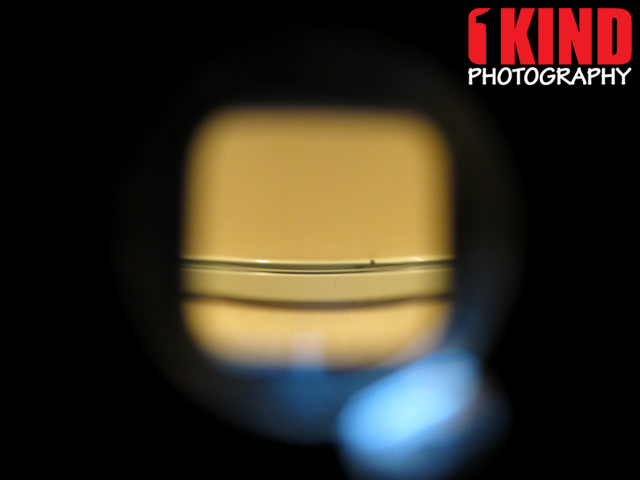 Control the manual focus from the distance trough your app, if AF is not an option. You can tune the focus in small, middle or large steps. Record videos with your DSLR through the Weye-Feye application. The Gallery will allow you to view, select and download the images from the camera’s memory to the smartphone or tablet directly and share them on social networks or sharing platforms. The integrated server allows up to 20 users to access the Gallery without installing the App. 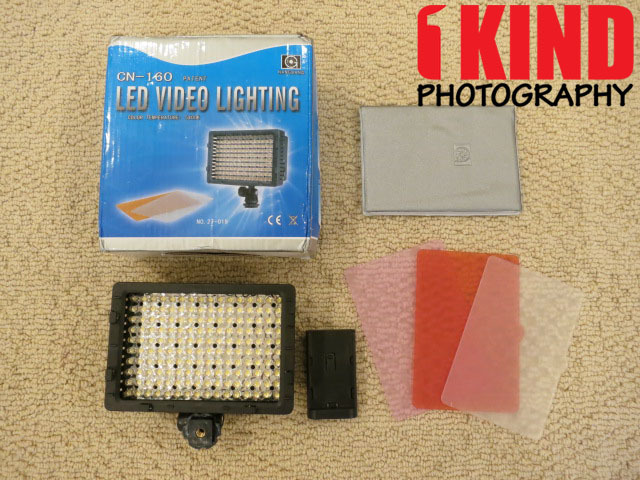 Overview : This CN-160 LED Video Light can adapt to different types of digital video camcorders and cameras. 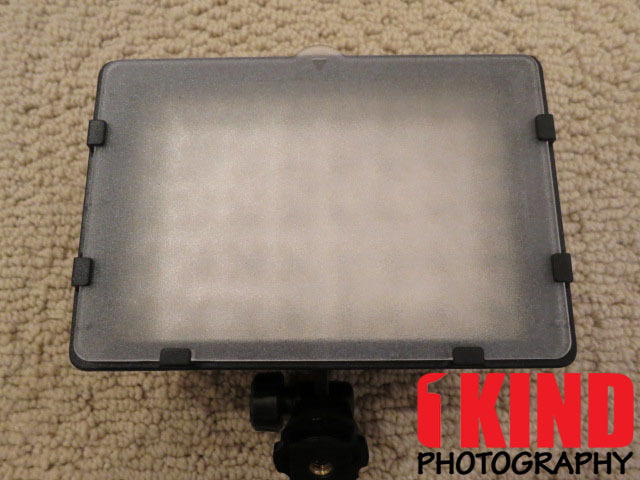 This super lightweight 160-LED Video light can be used in video taking, either for lights setup or supplement. The light intensity can be changed to offer professional effects. 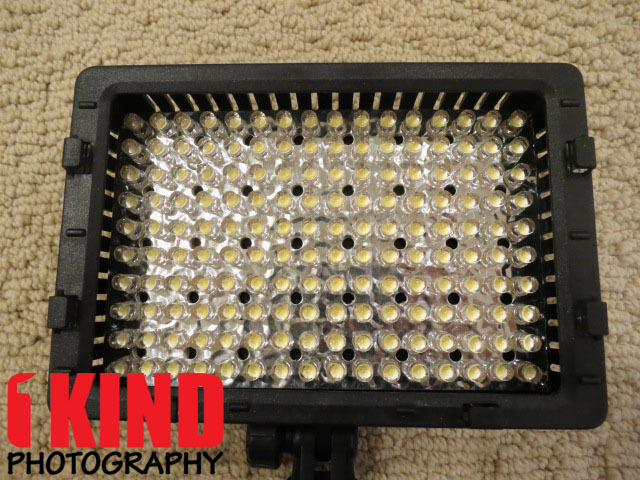 Quality/Usability : I've been looking at some LED lights in the event that I want to record some video or even take photos. 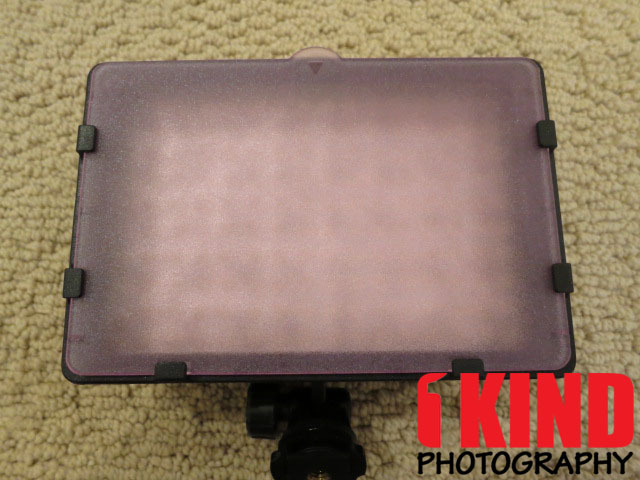 There are so many types and many of them are inadequate to light up the scene or subject due to low number of LEDs. It's also hard to see or know how much lumens are over the internet as opposed to seeing it in person. I had no choice but to take the plunge. The CN-160 is a popular product when searched on Google. It's sold under various brand names but is essentially the same product all around. 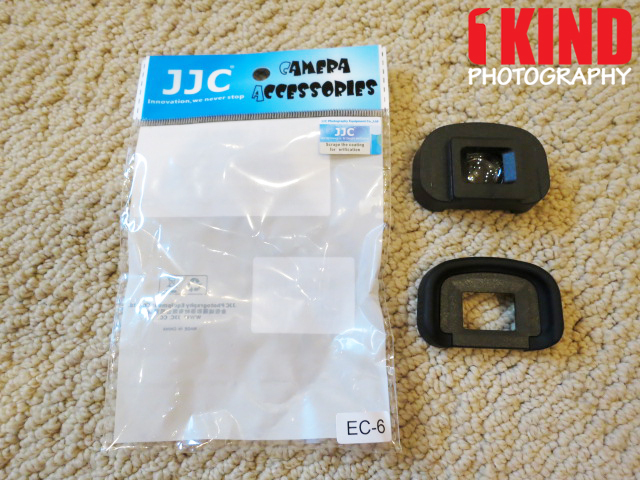 Included with the CN-160 other than the LED unit itself is a Panasonic battery holder, three (3) filters (soft diffuser, 3200K filter and pink filter) and a pouch to hold those filters. The front consists of 160 individual LED lights in a black plastic casing. The back has four (4) red LEDs that displays the batteries status and this is where the battery is placed as well. 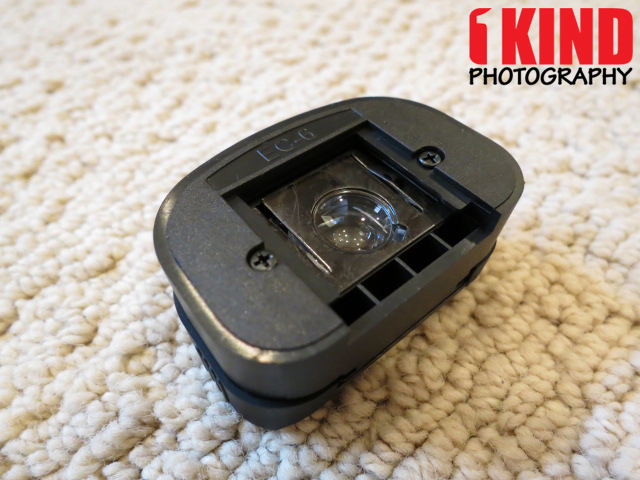 When faced down, the left side has a dial that acts as an ON/OFF switch as well as a dimmer to adjust brightness of the LEDs. 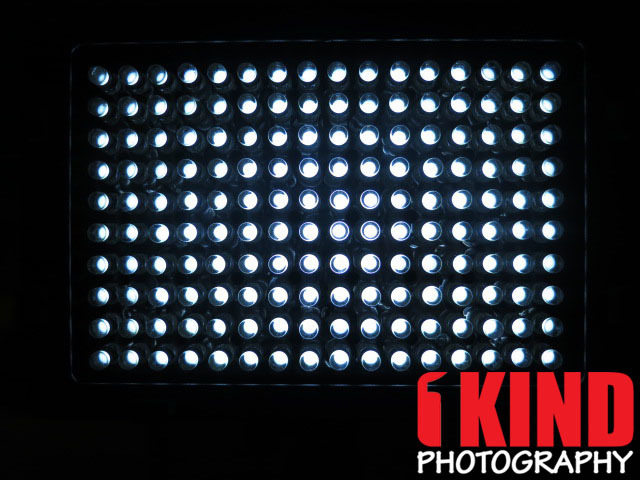 The CN-160 LED light can use a variety of rechargeable batteries such as the Sony NP-F550, Panasonic CGR-D16S or 6 AA batteries. 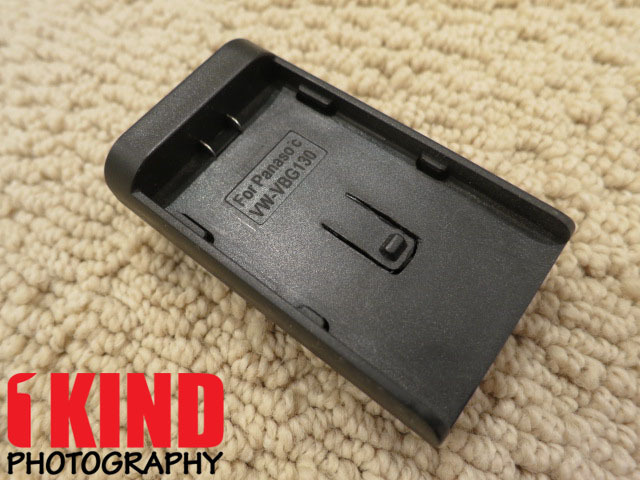 If using a Panasonic battery, you'll need to use the battery adapter plate. The CN-160 includes a battery cover. 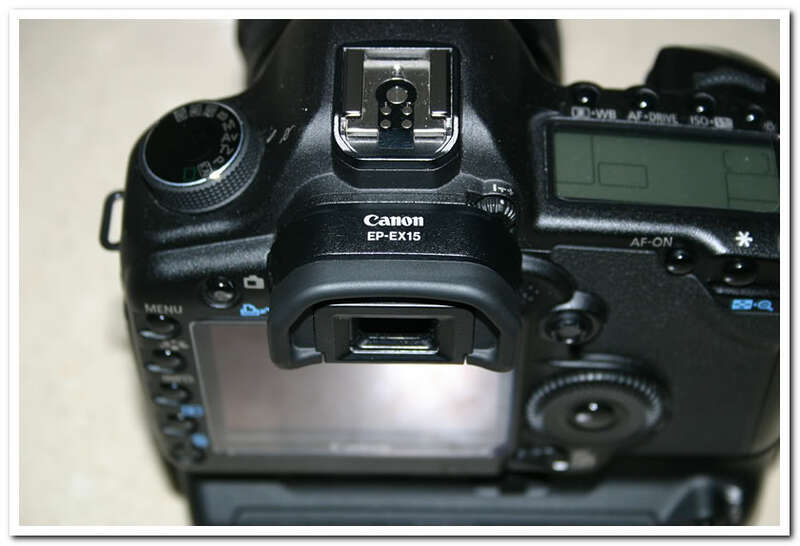 The CN-160 can be mounted on any device that has a hotshoe on it such as a video camera, camcorder and digital SLR. 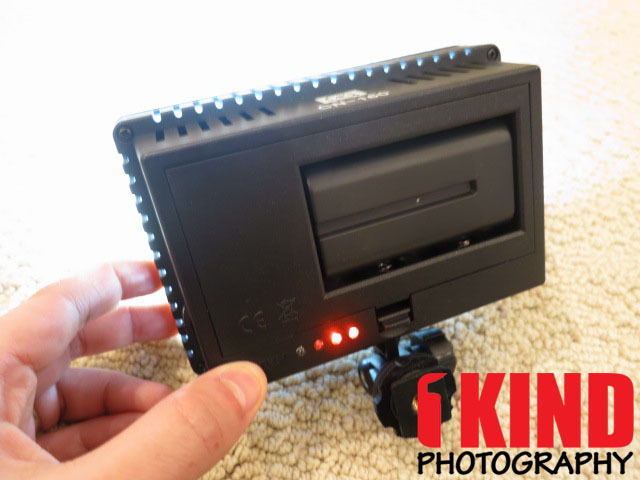 You can even mount the LED onto flash brackets, light stands or similar accessories. 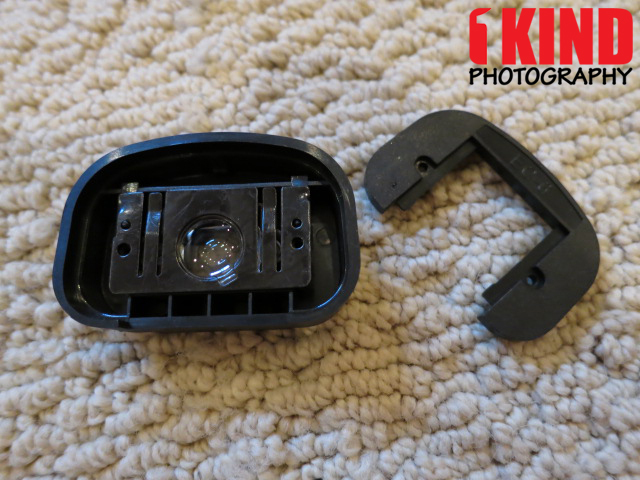 The CN-160 hotshoe mount is plastic and is tightened into place with a screw dial. Once mounted, you can adjust the CN-160 by aiming it up or down. The filter case can fold all your filters. 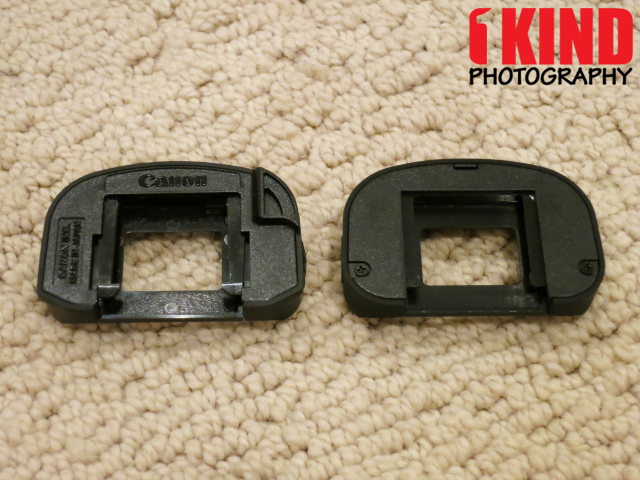 But trying to stick 2 filters in one slot feels like it's going to rip and stretch the pouch. The CN-160 outputs a decent amount of light. To attach the filters, you slide them from the top. The filters don't come off easily when shaken. So you don't have to worry about it falling. 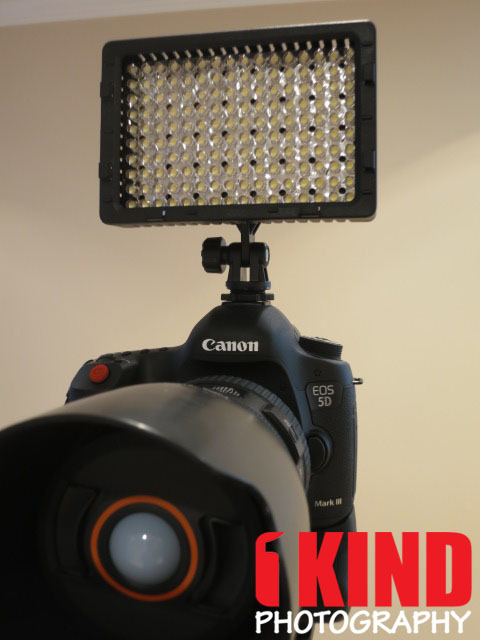 Conclusion : Overall, the CN-160 LED Light for Video Cameras DSLR Camcorders is a powerful LED light. This is great if you're a videographer for a wedding event or even a photographer. 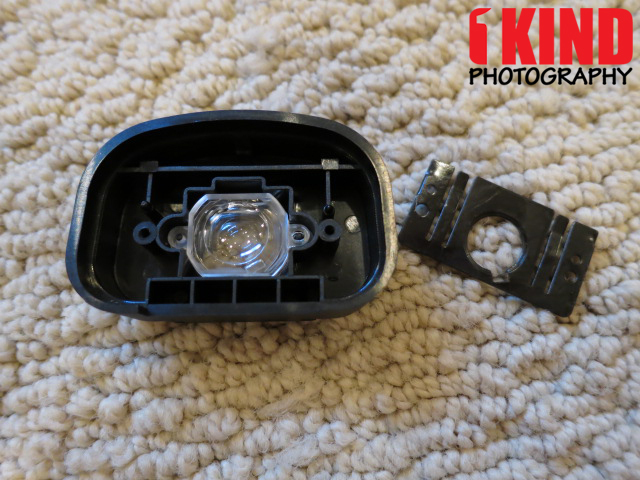 This can also be used as a flash light, source of light during a blackout or camping trip. 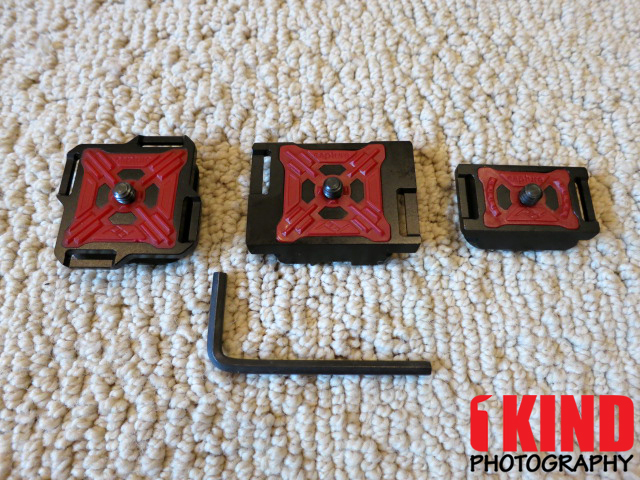 My only complaint is that the screw and hotshoe mount feels cheap. 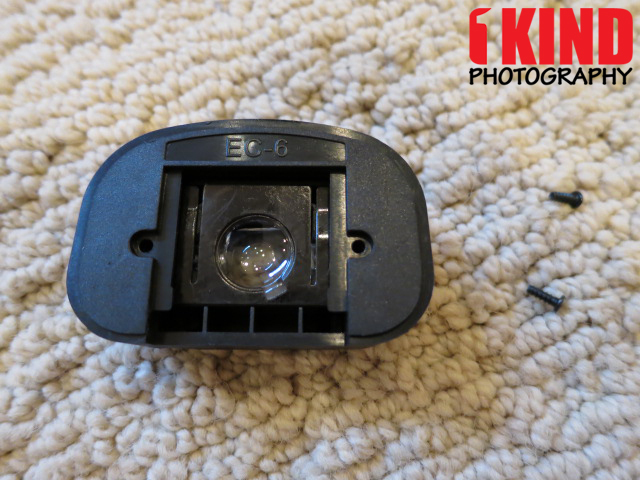 The hotshoe screw mount can be a little hard to remove if its screwed on tight. You may find this same light under a different brand name such as Neewer, Flashpoint, GiSTEQ and many others. Essentially, they are still also the same just rebranded. 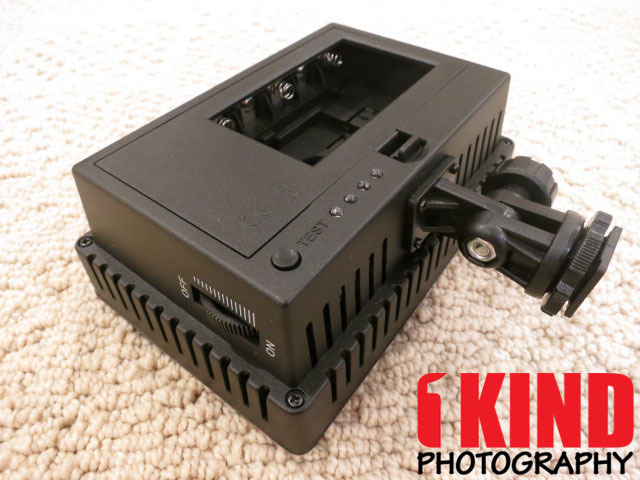 I highly suggested picking up Sony NP-F550 or Panasonic CGR-D16S battery. They will last longer than AA batteries. You can pick up batteries and chargers for really cheap if you don't already have them. It's always good to have 2 batteries and 1 charger. You can use 1 battery and have the second as a back-up. 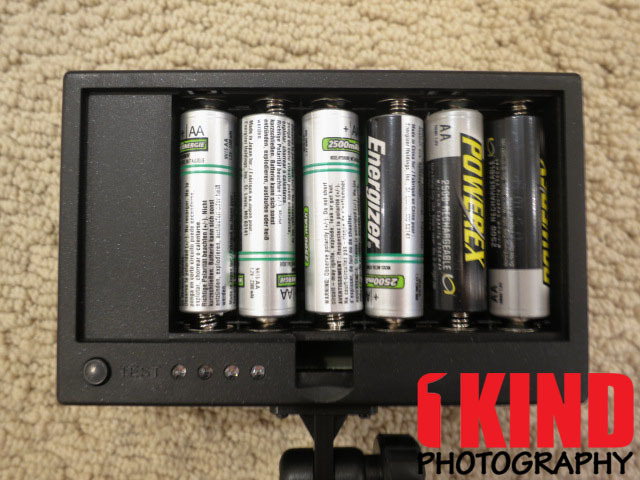 When the 1st batteries is lower on power, swap it out with the 2nd battery and begin charging the 1st battery. I suggest getting a SterlingTek, Wasabi or Maximal branded batteries.